The Farmer Automatic Drying System is a flexible tray dryer specially-developed for evaporation drying of liquid manure, digestates from biogas plants and further regenerative sources of energy. The resulting biomass can be easily stored, transported and also used as a natural fertilizer suitable for export. The system solution for biomass drying is fully equal to the challenges set by modern energy and agricultural economics. With the Farmer Automatic Drying System, the capacity per square meter dry surface and cubic meter air is greatly increased. The optimum use of hot air from the poultry house or the biogas plant means the energy and time required to dry damp biomass to a dry material proportion of over 80% reduces immensely. At the end piece on the dryer, the plates flip open and the substrate is gently tipped onto the floor below. The compact assembly of the modular system goes hand-in-hand with the increased drying capacity. 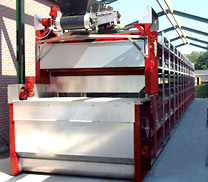 A double-layered belt runs in a horizontal belt dryer around perforated steel plates. Due to the high air ventilation and the large plate width of 2m, the dryer is considered extremely compact. According to requirements, the belt dryers can run on top of each other, and the length of the dryer can be varied as a module from 12 to 24 m.
The conveyor belt distributes the substrate evenly on the dryer plate belt. The key innovation of the biomass dryer is the perforated steel plates. These hot zinc galvanized, powder-coated steel plates are more stable and can be loaded with more substrate. The larger load capacity allows an increase in the amount and the size of the perforation holes. This means that an optimum water evaporation per kilogram substrate is possible, or air saturation per cubic meter of air. This ensures a larger drying capacity per square meter dry surface.